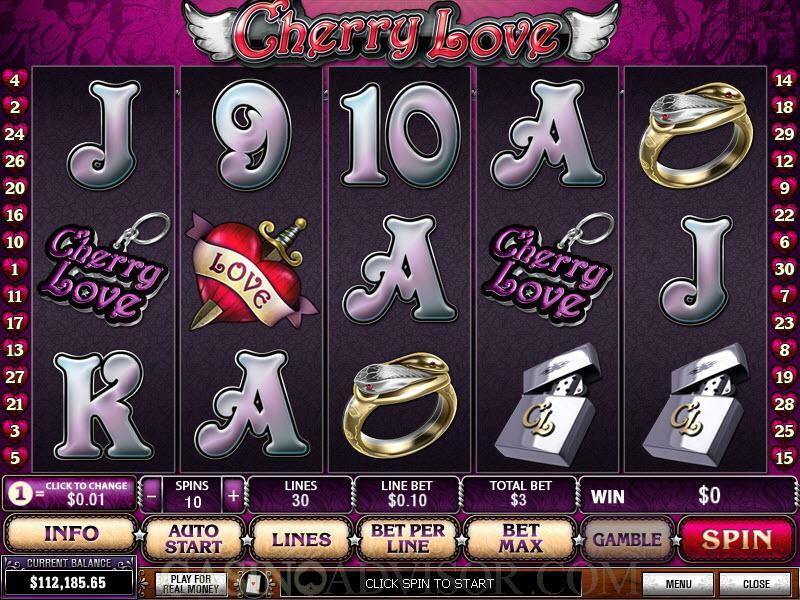 Cherry Love is an online slot game from Playtech. It has a love theme but with a touch of fatal attraction to it. The Girl has a heart with a dagger going through it tattooed on her shoulder and appears more overpowering than welcoming. The symbols on the reels are the Red Rose, Heart with Dagger, Ring, Cherry Love Key Chain and Cherry Love Lighter. The high value card symbols are steely grey in color bur crafted ornately and go well with the theme. The Girl is the wild symbol and the Cherries are the scatter symbol. The player can choose from eight coin denominations. These are 0.01, 0.05, 0.10, 0.25, 0.50, 1.00, 2.00 and 5.00. The slot game has 30 paylines and it is advisable that players enable all of them. This is because winning combinations pay only when appearing in enabled paylines. Players can wager up to 10 coins per payline. However, these are shown as line bets after multiplying the number of coins with coin denomination. Players can activate 10 coins per payline and all 30 paylines by clicking on the Bet Max button. The Girl is an expanding wild symbol but appears on reels 2, 3 and 4 only. 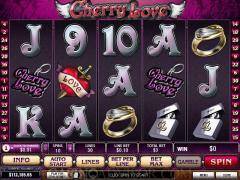 The Cherries scatter symbol offers scatter payouts when two or more appear anywhere on the reels. When three or more of these symbols appear on the reels then the free spins round is triggered. The scatter symbols are then emblazoned with "Free Spins". The player is offered 15 free spins at doubled payouts. The best aspect of the free spins round is that the Girl symbol appears as an expanded wild by rotation on reels 2, 3 and 4. When it appears on reel 2 the payouts are much larger. The free spins round can be re-triggered. 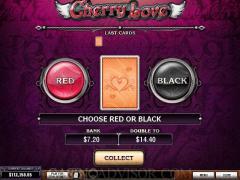 Cherry Love offers a Gamble Game after each payout. The players have the option of collecting the payout or staking it in the Gamble Game. In the game they have to guess whether the color of the card drawn will be red or black. If they guess right then they double the payout. If they guess wrong they lose the payout. Players can keep doubling till the limit of $1,500 is reached. If the players win a large amount in the Gamble Game there is a shower of gold coins on the reels while their balance gets updated. There is no progressive jackpot. The Red Rose and the Heart and Dagger symbols offer the highest fixed jackpots. These symbols pay out even when two appear from left to right in an active payline. Interested in reading more detailed information about Cherry Love? If so Click Here for more details.